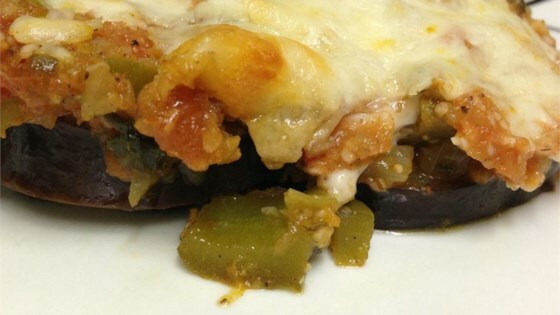 "This is a very cheesy and easy to make baked eggplant dish with an Italian flair. An excellent alternative to a pasta dish." Preheat the oven to 350 degrees F (175 degrees C). Brush eggplant slices with olive oil on both sides, and place them on a baking sheet. Sprinkle garlic powder over the top. Bake for 10 minutes. Heat 2 tablespoons of olive oil in a large skillet over medium heat. Add the onion, garlic, tomatoes and spinach. Cook and stir for a few minutes until fragrant, and the tomatoes have released their juices. In a medium bowl, mix together 1/2 cup of ricotta cheese, 1/2 cup of mozzarella cheese, and 1/2 cup of Parmesan cheese. Set aside. Place the eggplant slices in a greased 9x13 inch baking dish. Top with the spinach mixture. Spoon the cheese mixture over the spinach, and spread into a thin layer. Pour the spaghetti sauce over the cheese layer. Sprinkle the remaining mozzarella and Parmesan cheese over the top. Sprinkle with Italian seasoning. Bake for 30 minutes in the preheated oven, or until heated through and the eggplant is easily pierced with a fork.